Navajo people moved south into the south-west part of North America from their home in Canada about 1400 AD. So when the Spanish invaders came in the 1500s, the Navajo (Dine is what they call themselves) were themselves pretty new to the area. When the Navajo arrived, they had been nomads, who lived mainly by raiding the Pueblo people. But they soon began to learn new ways from the Pueblo people and began to settle down to farm corn and beans like them. Still, when the Spanish settlers brought sheep to North America for the first time, the Navajo were happy to give up farming and instead, in the 1600s, they began to herd sheep and goats. They learned how to shear the sheep and weave the wool into blankets and rugs and clothes, and they were able to trade their lamb and mutton and their blankets and rugs and clothes to Pueblo people and to the Spanish settlers for the corn and beans that they didn’t grow themselves. But through the 1700s the Navajo also went on getting some of their stuff by raiding their neighbors – the Pueblo people, the Ute, the Paiute, and the Spanish settlers. Navajo raiders took sheep, horses, corn and beans, silver jewelry and steel tools, and people to sell to the Spanish as slaves. With horses, the Navajo were able to do a lot more raiding. This raiding made the Navajo a lot of enemies. Cite this page: Carr, K.E. 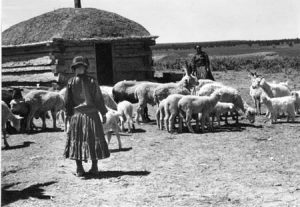 The Navajo get sheep – American history. Quatr.us Study Guides, August 13, 2017. Web. April 19, 2019.